CES 2019 The most eye-catching debuts at CES 2019 are more analogue than digital, and dumber rather than smarter. 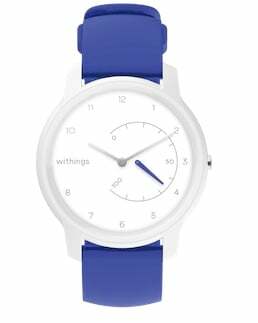 Withings has launched its first new products in almost three years, having survived a period of ownership by Nokia. Two Withings Move watches minimise the "smart" but provide continuous fitness tracking, and boast a battery life of 12 and 18 months. The latter, however, includes an ECG (electrocardiogram) sensor the user can activate in the case of atrial fibrillation (irregular heart rate). The Move has been priced at $70, $130 for the Move ECG – fitness band territory. That's likely to be where the elusive mass market is, too. Most of the Watches Apple sells are the 2017 Watch 3 or older. Less than 20 per cent of Apple's Watch sales were Watch 4 in Q3, IDC said last month (Apple and the retail channel continue to sell both 3 and 4 series). Geneva-based MyKronoz, which raised $6m in crowdfunding in 2017, also slapped analogue hands onto a low-power chip – which is the secret behind the long-life wearables. MyKronoz takes advantage of Fujitsu's Ambiq embedded micro controllers, which allow the manufacturer to dispense with expensive, power-guzzling SoCs. The Apollo2, for example, draws less than 10 μA/MHz. The two new wearables use the Apollo3 chip, but can nevertheless support voice recognition, and remain in "dumb" mode for 60 days, or "smart" mode for four. Late last year, Huawei introduced a sub-£200 wearable with battery life of three weeks, adopting a similar philosophy: continuous tracking and notifications, but no bloated apps. Apollo2 supports the gyroscope, accelerometer and magnetometer needed for fitness tracking – and the Bluetooth required for communications with a phone (exhaustive tech details in this PDF).